What's the story behind the old cemetery on Shelburne Road in South Burlington? Motorists driving on Route 7 in South Burlington can be forgiven if they never notice the small, unmarked cemetery nestled in the woods on the west side of the highway. That stretch of Shelburne Road, with its abundance of big-box stores, furniture outlets and car showrooms, is better known for its Olive Garden than burial garden. In short, times change, and so does the scenery, and so it happened that scores of 19th- and early-20th-century Vermonters, including several War of 1812 veterans, were laid to rest in a graveyard that ended up sandwiched between a Champlain Farms Gulf station and the Freedom Nissan dealership. What must have once been a tranquil sanctuary for solemn repose is now awash in traffic noise, diesel fumes and the stench of deep fryers. WTF? Though no signpost, wrought-iron gate or paved walkway marks its entrance, the Shelburne Road Cemetery, as it’s officially named, is one of only two municipally owned cemeteries in South Burlington. (The other is Eldridge Cemetery near Burlington International Airport.) The 1.5-acre parcel of land was deeded to the city in 1865 when Burlington and South Burlington were split into separate municipalities. Today, just about the only evidence that it’s not a vacant lot is the mown lawn, courtesy of the Public Works Department. On a recent visit to the Shelburne Road Cemetery, a shopping cart full of leaves and plastic bags sits abandoned near the entrance. Once a visitor ventures through the trees that screen it from Route 7, the cemetery itself looks largely empty, with one cluster of graves near the front and another at the rear. The headstones are in various states of disrepair, though many inscriptions are still legible, including some dating back to the early 1800s. The town clerk’s office had little information to offer about the cemetery’s history. Likewise, Bill Szymanski, South Burlington’s 83-year-old cemetery commissioner, could say only that it’s still considered “active.” Plots are available to the public for $300 apiece — to Szymanski’s best recollection, since no one has been interred there for more than a decade. What do the epitaphs in Shelburne Road Cemetery tell us about its permanent residents? Many of the names are common in this area, including Barstow, Catlin, Harrington, Irish and Spear — that last the family for which Spear Street presumably was named. More than 40 graves are listed in town records, while online websites such as interment.net and findagrave.com list as many as 129. While walking the Shelburne Road Cemetery himself, Wallace said he encountered only two epitaphs worth noting. The relative lack of publicly available information about the Shelburne Road Cemetery isn’t surprising. 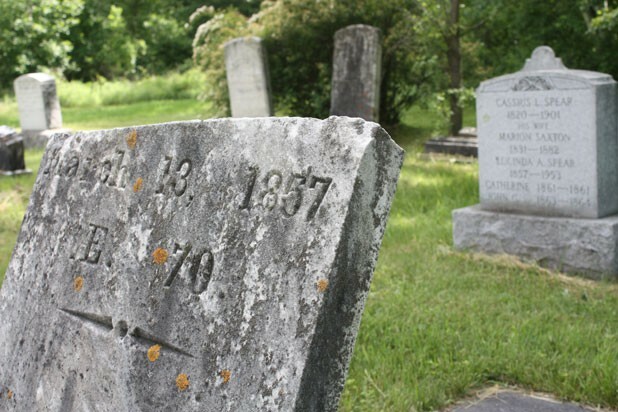 Vermont, like most states, maintains no central database or registry of cemeteries or gravesites, noted Josh Slocum, executive director of the Funeral Consumers Alliance of South Burlington. Slocum, whose nonprofit serves as a watchdog for the funeral industry, was interviewed at length by Anderson Cooper for the May 20 episode of CBS’ “60 Minutes.” The story, called “Final Resting Place,” explored some of the more egregious cases of fraud and abuse in the cemetery industry, including the covert exhumation and disposal of bodies and headstones by cemetery employees seeking to resell plots. Slocum, whose office routinely fields complaints about cemeteries, funeral homes and crematoria, has been pushing Congress to enact legislation regulating cemeteries similar to the federal laws that already govern funeral homes and crematoria. That said, Slocum is far less concerned about historic cemeteries falling into disrepair than he is about the “active harm” being perpetrated on consumers who are still alive.